The body has to move in order for all its various systems to function properly. 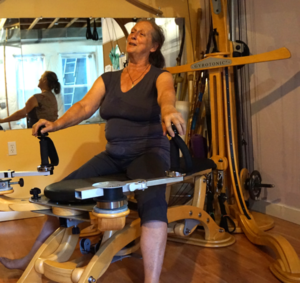 Movements in the GYROTONIC® methodology help to direct the effort of the exerciser to the most efficiency and benefit out of even the simplest movements. This is particularly important for the aging body, because Gyrotonic exercises can dramatically increase circulation and enable more mobility where it has been lost, and keep mobility from being lost. The machines and the Trainers offer complete support so no matter what the age, the strength, the flexibility, or the injuries, the movement is safe and fun. Increasing the ability to breathe and move freely are just a few of the joys one can experience in the studio. GYROTONIC® Boulder has been working with our elders for years in a delightfully playful and energetic manner; the eyes sparkle, the skin glows, the humor re-emerges, and the step is springier.